RC World UK: Smartplane Controlled by your Smartphone ! Forget big, bulky remote controls. The best remote control is already within your reach: your smartphone. You can fly the SmartPlane with just one hand – simply slide your thumb to go up and down, and tilt the phone to turn. PhD in aerodynamics: not needed ! The SmartPlane is no ordinary toy. 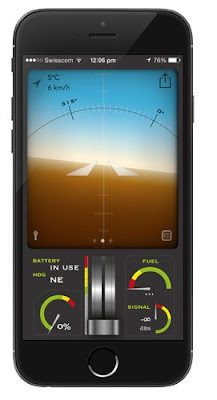 It lives, breathes, and understands your commands – analyzing the situation and automatically making adjustments and corrections to assist you while flying. But you wouldn't know if we didn't tell you ! The SmartPlane works with the latest BluetoothSmart wireless technology for long range and flight time. Oh, and there is no cumbersome pairing. Simply hold the phone close to the plane and you're ready to fly. That's Touch&Go for you ! Designed for people like you and me. at the arrival terminal ! Not enough features? We've got more. A "smart" plane needs smart technology. Traditional Bluetooth 2.1 or WiFi was simply not enough – we went one step ahead and incorporated the latest BluetoothSmart standard, with long range (up to 60 m), and extremely low power consumption – so there's more available for your plane's engine. No clumsy dongles needed ! With Touch & Go there is no pairing, no waiting! Simply open the SmartPlane app, touch the plane with your phone, and you are connected within seconds. Flying with friends? It's easier than ever to choose which plane you want to connect to. Pssst: sneakily touch your friend's plane before they can, and surprise them ! The result of 2 years of aerodynamic optimisation: the SmartPlane flies sloooowly, and yes that's an advantage! You no longer need laser-sharp reflexes and a football field sized area to enjoy flying – your office hallway is enough. But that doesn't mean you can't do fast maneuvers - use the wind and throttle lever to your advantage. What use is an intelligent plane if you can't control it precisely? We built-in a 256-level proportional rudder with logarithmic correction – the most advanced in its class – so your hand movements get translated to very natural turn angles. The FlightAssist™ feature makes full use of this extended range to give you a stable flight without compromising maneuverability. The SmartPlane is powered by a state-of-the-art Lithium-Polymer battery which weighs just 1 gram. You can enjoy flying your plane up to 30 min on a single charge (hint: soar and glide! ), and recharge in 15 min using a standard microUSB cable (included in packaging). Even at full throttle, the battery lasts at least 5 min and recharging takes under 20 min ! Planes are built for flying, and crashing! So was the SmartPlane. It is built with durable EPP (expanded polypropelene) material which retains its shape even after being bent. The engine and propeller are offest inside the plane's nose, so any head-on collisions will not cause severe damage. We've included an extra prop, just in case ! Although the SmartPlane has a little microprocessor of its own, the real brain behind it lies in the smartphone app. This lets us continuously improve the plane by adding more features to the app. For example, the FlightAssist™ feature, which dramatically improves the flying experience, was added as an app update during development. The possibilities are endless. We take app updates one step further. Using state-of-the-art technology, we can wirelessly push updated firmware to the plane even after it's out of the factory. This means your SmartPlane is always up-to-date with the latest bugfixes and feature enhancements. All you need to do is install the latest app update. The next time you connect to your plane, it will be automatically updated.